That last post on Summer Aspirations was excellent for me, personally, because it motivated me to poll the rest of the family and get started on our summer To Do list. There was unanimous and enthusiastic support for a Van’s/Music Man combo outing, a visit to the Schuyler Mansion, kayaking, and berry picking. Yesterday was a mostly-free day for the girls, so we decided to jump right in with some berry picking, especially since that’s a time-sensitive activity. Ta-da!! We picked four pints of these babies at Indian Ladder Farms. The truth is that Indian Ladder Farms is a bit of a schlep from our house, but we wanted raspberries and blueberries, and we know they’re reliable. The girls were surprisingly willing to take the long drive, and they sat together in the back seat and happily sang Hamilton songs at full volume both ways. I was happy that there’s been enough technological progress that now I can rely on GPS to get there. Back when the kids were very little, I’d go there on Niskayuna Moms’ Group outings to pick fruit or visit the baby animals and I would always, always get lost on those winding country roads. So, hooray for GPS! Again! 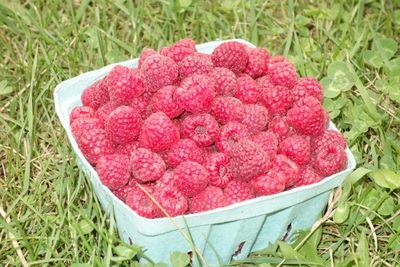 When we arrived, it turned out that the blueberries were too sparse and picked-over to pick, but there were plenty of raspberries. We picked furiously because it looked like the skies would open at any moment, but we managed to avoid the rain entirely, so yay us. My kids are doing a tremendous job eating the berries, but it’s a lot of them, so I finally got around to trying that rinse-the-berries-in-vinegar trick, which is supposed to kill off mold and bacteria. Really, I’d been reluctant to subject my precious berries to vinegar in case it made them taste funky, but with my berry abundance, I figured that I could risk spoiling a few. It worked just fine and they still tasted, you know, berry delicious. Hardy, har, har. Just as I was finishing up on giving the berries their special spa treatment, it occurred to me that it would have been cooler to leave a few berries untreated as a scientific experiment. But it was too late for that, so maybe next time. Speaking of preventing waste, I had most of a bottle of red wine that kept calling to me that it needed to be consumed before it went bad, but yesterday was more of a humid beer or hard cider day. I ended up making a faux sangria with our current favorite juice, some lime juice, and a smidgen of agave, and it was delicious. I slurped it down and am looking forward to finishing off the bottle later. I might have to buy a box of wine and have a party.